April 29, 2012 - About 30 Alaska Airlines operations management team employees from the Bay Area literally went to the dogs recently to experience and learn the challenges of the visually impaired. Guide Dogs for the Blind (GDB) invited Alaska and Horizon Air employees from the three Bay Area airports to its campus in San Rafael, Calif., to provide insights into what it takes to be a guide dog, understanding the relationship between the dog and its owner, and "walking in their shoes" when it comes to flying. "As Alaska Airlines managers, we wanted to understand how we can make blind or visually impaired customers have the best experience with our airline as possible or themselves and the guide dogs," said Bill Essick, Alaska Airlines' sales and community marketing manager in San Francisco. "Our goal, in keeping the Alaska Spirit' alive, is to create a diverse and inclusive environment. 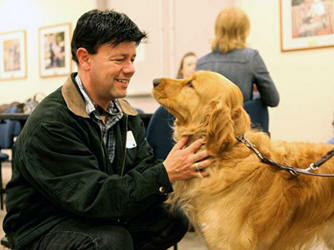 That means understanding what those dogs do for their owners and the special bond that develops." The employees were met by Paul Lopez, CEO for Guide Dogs for the Blind, who talked about the journey of a guide dog's life from breeding to puppyhood to training and finally hitching up with the new owner. Employees were allowed to walk with a guide dog in-training, issue commands and get a feel for how the dogs respond to certain commands. For those brave enough, some people were encouraged to close their eyes and allow the dogs to guide them in darkness. "It was nerve-wracking to close my eyes and think that I have to trust this animal to get me around," said Michele Harris, Alaska Airlines' customer service supervisor in San Jose, Calif. "You are so vulnerable. I had to put my faith in the dog and let the dog take charge." Sierra Fish, community resources manager for Guide Dogs for the Blind, said it was the first time the organization brought airline employees to its campus to help them understand the working relationship between owners and guide dogs. "The goal is to get people and dogs safely from place to place," said Fish. "If airline employees have a better understanding of what it's like to rely on a guide dog to travel, we've created an awareness that is great for all concerned. We were thrilled at how the experience went and will likely look for more opportunities." Fish said the program supports about 800 puppies per year, and only about 40 percent pass the test to support the blind. Dogs that aren't selected become "career changers," a term used when they go on to serve elsewhere such as search and rescue or police worker are offered to the original families that raised them. The organization has a list of 3,000 people who want to adopt a dog that doesn't make the cut, although only about 40 dogs per year are available. "It was a real eye-opener for us, even with our eyes closed," said Essick.